Start by toasting your bread crumbs. Pre-heat your oven to 375 degrees F and line a large baking tray with parchment paper. Spread the bread crumbs out in an even layer and toast for 3 minutes. Toss well, spread even again, and toast for another 2-4 minutes. You’ll want to watch them closely as they can go from browned to burned rather quickly. Once done, place in a shallow bowl and set aside. Drain the liquid of your chickpea can into a bowl and set aside. In a small bowl, mix together 2 tablespoons of the chickpea liquid with 1 tablespoon of flaxseed meal. Let sit for 5 minutes to thicken. In the bowl of a food processor, add the chickpeas, oat flour, garlic powder, the flaxseed meal mixture, and adobo seasoning (or salt and pepper if using those instead). Process until fully combined. Taking about 1 1/2 tablespoons of the chickpea dough, form nuggets. I found it easiest to pat them into ~1/3 inch thick rectangles and then gently round the edges to get a more classic nugget look. 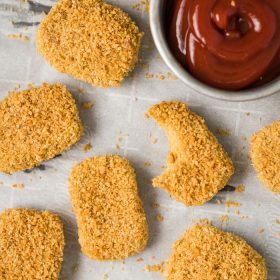 One at a time, dip the nuggets into the chickpea liquid so that it’s fully submerged and then roll it in the breadcrumbs. Very gently press the panko into the nuggets so that it sticks better. Place the nuggets on your baking sheet and bake for 15 minutes. ENJOY!